Following on from my previous #AlproTops post, I thought I best inform you guys of how I got on jazzing up my breakfast with the help of some gorgeous toppings from Alpro. First of all, I have to say I was totally blown away by the amazing soya yoghurts Alpro has to offer - I absolutely adored the strawberry and rhubarb flavour, and was a big fan of the vanilla too. In terms of toppings, I really enjoyed mixing things up and trying out new flavours, combining toppings and working out which toppings went best with which yoghurts. 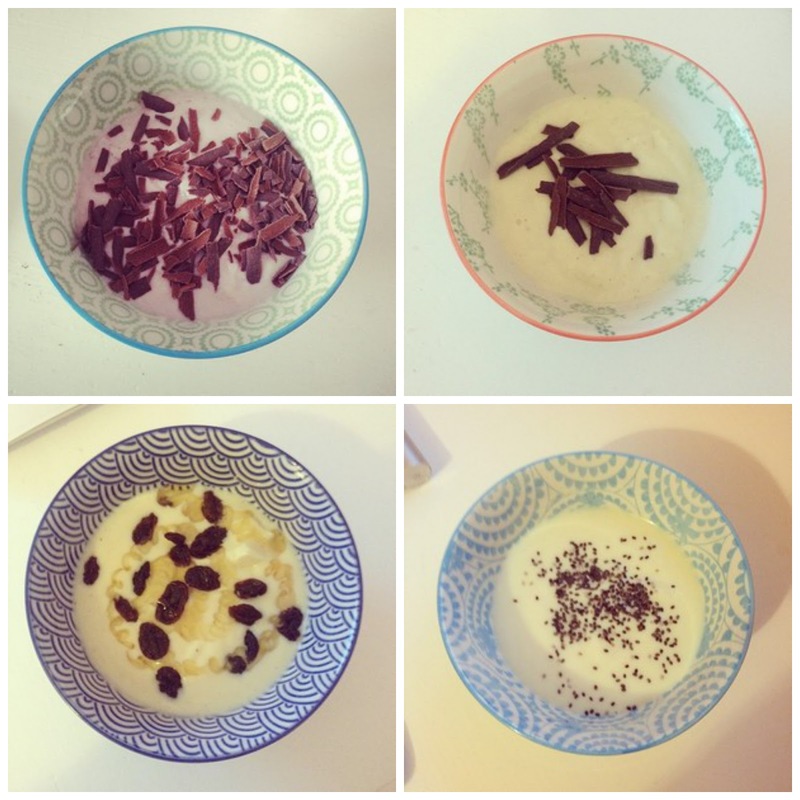 Above are just some of the yummy creations I put together whilst trying my hand at different toppings for Alpro. You can probably tell I'm a big fan of chocolate, and the dark chocolate flakes were amazing with with both the vanilla yoghurt and the strawberry and rhubarb. I also gave the vanilla yoghurt a go with some honey and raisins drizzled over it, and this was totally delicious. It also tasted great with the plain yoghurt. I also went zesty with the lemon and lime yoghurt and kept things really healthy by chucking some chia seeds on there. Another combination I really liked together was the plain yoghurt with coconut and mango, which tasted so yummy and exotic. One of my favourite breakfasts was plain yoghurt and muesli, with a topping of bananas and strawberries. So delicious and so healthy. Taking part in the #Alprotops campaign has definitely made me a bit more adventurous when it comes to breakfast time (and snack time!) I am definitely the kind of person who is very set in their ways when it comes to food and I'm sometimes reluctant to try new things, but this campaign really opened my eyes. I really enjoyed it and would like to thank Alpro for letting me take part. Which toppings do you like the sound of?